Fully programmable data converter for access systems, with an internal relay and Usb interface. The 718R converter is a user programmable converter which will convert any of the following formats: magnetic stripe (tracks 1 & 2), wiegand (standard, alphanumeric, and aba weigand), serial, wand emulation, and f2f. Up to 250 bits can be processed for both inputs and outputs.Â The 718R also contains a form-c relay which can be controlled by serial commands. Note that the 718R converter can perform conversions in one direction only. 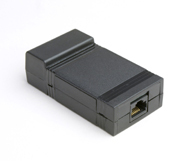 This is due to a limitation on the RJ45 connector. A user-removable jumper on the board allows the 718R to process data from serial (usb) to wiegand, wieaba, alphawie, track1, track2, f2f, and wand emulation, or, convert wiegand, track1, etc. to usb serial. Standard Wiring Type B for usb connection.